Artcroft’s mission is to provide direct support to individual artists and the community. The residency program allows literary and visual artists an environment to work creatively, with minimum distraction. Support to the community is achieved through arts programming, collaborations, small venue presentations, and partnerships with other cultural organizations. We seek to establish the relationship between art and community. Artists are encouraged to work on their own creative ideas while in residency at Artcroft, and can have the opportunity to exhibit and sell work in our Gallery. The term “croft” comes from the Scottish word for “craft.” Craft and trade people were an essential part of agricultural estates and were known as crofters. They lived and practiced their skills for the smooth operation and agricultural and commercial success of the community. 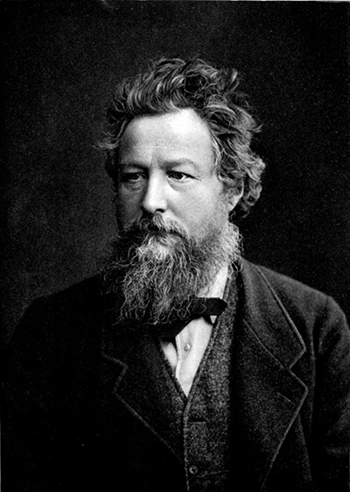 William Morris was a poet, artist, and social reformer who urged a return to the medieval traditions of design, outstanding workmanship ,and community. His work in both poetry and the applied arts was characterized by an emphasis on decorative elements that he thought were characteristic of the Middle Ages. Through many of his writings, he attempted to correct the dehumanizing effects of the Industrial Revolution by suggesting a form of society in which people could return to the joys of master craftsmanship and simplicity of expression. He perfected the use of woodblocks for printing wallpaper and textiles. The idea of the house as a total work of art, with all of the interior objects designed by the architect, emerged from his studio and remained standard practice throughout the Arts and Crafts movement. The seeds for the Artcroft concept grew from the discussions of Robert and Maureen Barker and Florence Thorne. The three friends were guided by an appreciation of the unified continuum of work, craft, and art supporting community life and the larger culture. With their strong interests in the arts and humanities, developing a retreat where individuals could do creative work in a rural, agrarian setting held great appeal. The friends realized that there were already several precedents for this concept; the McDowell Colony in New Hampshire is a fine example. Using these ideas, as the foundation for developing an artist’s retreat, Robert, Maureen and Florence generated a long-term plan in 1999 and began implementation. Artcroft is striving to manifest those ideas, with enthusiasm and excitement.